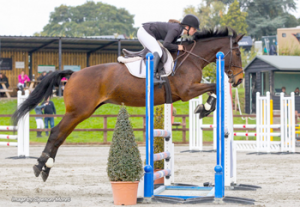 Codham Park Equestrian in Braintree, Essex was the venue for two Dodson & Horrell National Amateur Second Rounds, both of which were held on Sunday. Competitors came forward for both a 0.85m and a 0.95m second round and each starter was aiming to pick up one of the twelve qualifying tickets on offer in each second round for a place at the Dodson & Horrell National Amateur Championships next month 18th – 22nd November at Aintree Equestrian Centre in Liverpool. Solid performances from a number of competitors saw a ten horse jump off unfold and the win came from the very last combination to go. Seventeen year-old Saffron Baker from Ipswich, Suffolk used the draw to her advantage, scooping victory on board Ann Withey’s 13 year-old bay mare, Loulabelle II. Having seen seven double clears produced before her, Saffron knew that only an accurate quick round would do and she duly delivered. Saffron and Loulabelle posted their double clear in 35.06 seconds, shaving just 0.38 of a second off the time of their nearest rivals. Kerrie Goodwin from St. Albans, Hertfordshire took second place with her own 19 year-old chestnut gelding, Roscoes Golani after they clocked up their double clear in 35.44 seconds. This saw them finish as only other combination with a double clear in under 36.00 seconds. 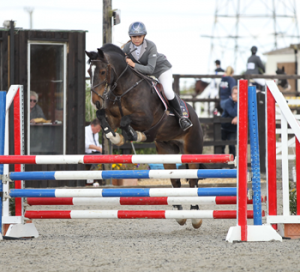 Young showjumper, 13 year-old Alice Casburn, from Norwich, Norfolk rounded off the podium places on Caroline Casburn’s 9 year-old bay mare Rhydfendigaid Groten Goch. They produced their double clear in 36.73 seconds. On Saturday 17th October, Britain’s William Fox-Pitt and his horse Reinstated fell during the cross country phase of the 2015 FEI World Breeding Eventing Championships for Young Horses in Le Lion d’Angers, France. The emergency teams arrived immediately and gave William all necessary care in order to manage his transport to the Angers Hospital. The horse was uninjured. At present, there is no change in William’s condition; he has undergone more tests and will remain sedated and under observation. Volunteer lifeboat crew from Wells RNLI were called out to three horses and their riders who were stranded on an island off Burnham Overy Staithe after being cut off by the tide. 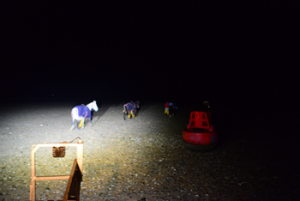 The lifeboat crew are used to improvising when it comes to saving lives at sea, but nothing quite matched what they have been trained for when, in the early hours of the morning, in the pouring rain, they rescued three horses and riders off an island on foot. The riders were stranded on Scolt Head Island and were cut off by the tide. They had taken their horses out for a ride at Burnham Overy and had crossed over to Scolt Head Island on the other side of the harbour at low water. Whilst there, they miscalculated the time of the tide and ended up being cut off and unable to return across the channel. Wells inshore lifeboat was paged just before 6pm on Monday 12th October and launched a few minutes later. Horse expert, Maddie Rainsford, who’s the wife of an RNLI volunteer, stood by to give advice as the lifeboat shipped out a tent, food, warm clothing and horse rugs to keep them warm. Even though they were advised not to, by both the RNLI crew and the coastguard that it would be too dangerous for them to return at low water in the dark, the three women decided they wanted to re-cross the channel at the earliest opportunity. They were deterred from making the crossing late on Monday night, which would have meant wading through a dangerous receding tide. Instead they were persuaded to wait until low water at 2am Tuesday 13th October. The crew, using their ‘Soft-Track’ transporter tractor to light the way, guided the group back to safety on foot as there was now no water in the channel. 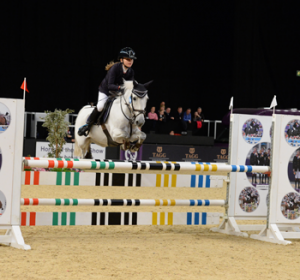 It was 12 year-old Lily Grimwade from Danbury, Essex who secured the HOYS 128cm Showjumping title in style on Saturday 10th October at Horse of the Year Show. The Championship class saw twenty four starters come forward with ponies of no more than 128cm in height; with eight of them managing to jump clear in the first round. Making her debut at the show, Lily was the only rider to deliver a clear in the jump off which was enough for her to secure the title outright on Koda, a 16 year-old grey gelding owned by Matthew Grimwade. Grimwade was elated with her win “I am really surprised and really happy. He has taught me how to ride basically and I love him so much” she said. Second place was awarded to Madison Heath riding Shirley Ash’s Red Alert III and rounding out the podium places was Claudia Moore riding her mother Katrina’s Peppino Il Grande. Southend schoolgirl Hallie Lunn went top of the class at the Horse of the Year Show in Birmingham on Wednesday 7th October. 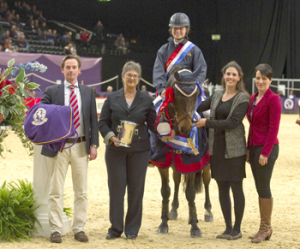 The 14 year-old whose pony Little Boy De Carman, a bay gelding owned by Richard Lunn, is two years older than her – won the Blue Chip Pony Newcomers Championship on a busy opening day’s action at the Genting Arena. The combination won a highly-competitive class and their jump-off time of 36.62 seconds proved just enough to prevail over runner-up Jessica Hewitt, riding Wildwood Silver, while Millie Dickinson, with Ron Burgundy, finished third and Harry Charles fourth on Phoenix VI. “I am kind of speechless,” said Hallie, who attends Southend High School for Girls. “It is the first big thing that I have ever won, so I am a little overwhelmed. It means so much to me. “It is such a great experience riding at Horse of the Year Show. It is not every day that you get to ride in such a big arena and watched by such a big crowd. 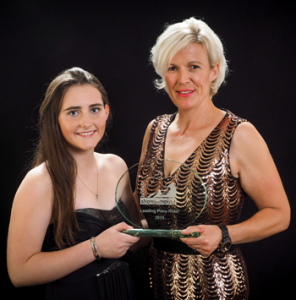 15 year-old Jodie Hall Mcateer from Borehamwood, Hertfordshire pick up the Leading Pony Rider Award at the 2015 British Showjumping Awards Ball recently. Jodie was successful at the Pony European Championships in Malmo, Sweden where her solid performances helped secure both Team Gold and Individual Silver. The ball was held at the St Johns Hotel, Solihull and saw guests celebrate alongside the extremely worthy nominees and winners. Photo: Jodie Hall Macteer being presented by Sally Evans from Next. Abbi Jackson from Sandy, Bedfordshire on her mother Vikki’s 10 year-old bay gelding Christopher Robin IV scooped the victory in the Dodson & Horrell 0.85m National Amateur Second Round held during the Arena UK Festival of Showjumping in Grantham, Lincolnshire. With qualifying for the Dodson & Horrell National Amateur Championships at Aintree Equestrian Centre in Liverpool (18th – 22nd November) a priority, each competitor was focused on taking one of the twelve direct qualifying places on offer in each class. Abbi and Christopher Robin IV beat twenty-seven other combinations to take the top spot in this second round. They used a late draw in the jump off to their advantage, posting an accurate and fast round to finish up with a double clear in 33.14 seconds and this was to prove good enough for the win.